Reminder that today is the last day to order the One Location, One Color Screen Print T-shirt sale. Sale ends at 5:00 PM today (4/12/2010). Great prices, superior work on name brand products. 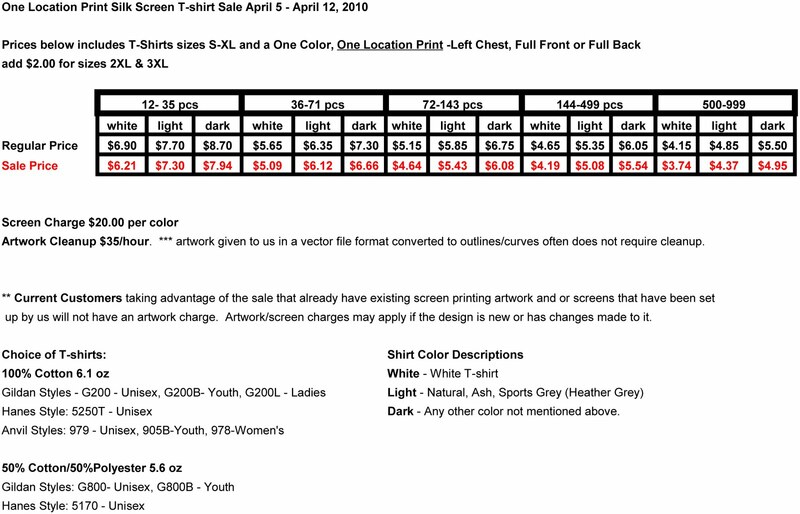 Reminder that our Spring, Once Color,Onle Location Screen Print T-shirt sale ends at the close of the business day Monday April 12, 2010. Don't forget to take advantage of some great prices, superior work on name brand products. It’s still spring, but it's feeling like summer! Do you have a spring outing or event coming up. Looking to purchase new T-shirts for your Staff or Work Crew? 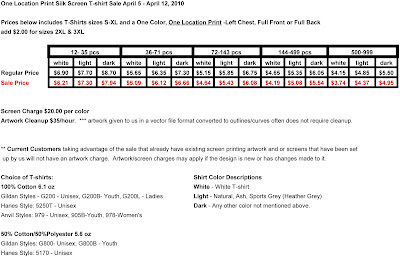 Now through April 12, 2010 we are having the One Color, One location print T-shirt sale. Here is your opportunity to take advantage of some great T-shirts at GREAT prices. Your choice of 100% 6.1 oz cotton or 50/50 Blends from Brand names such as Hanes, Gildan & Anvil. Men’s, Ladies & youth cuts available in the brands and styles shown below. Now is a great time to stock up! If you have any questions, please call, e-mail or stop by! Spring is here!!! As well as new spring specials to start the season!! Check your e-mails, our blog, Facebook and Twitter Pages for Money saving specials starting next week on great products at great prices!